Yeah, I like it very much! K-ON is going to end. Hope for a happy ending. They all go to the same university together. Great job, the wallpaper look very cute! K-on is reaching their end, hope there is a third season continues their story. i really love this wall, it goes to show that collage's CAN work when you apply an artistic eye to the wall. you really used the right sizing and combined strokes/drop shadows and shapes beautifully, everything really flows and allows the viewer to read a structured story despite the chaotic composition. your texture really needs to go though, its too big/pixelated/artifacted which detracts from the professionalism in the rest of the piece. similarly, for the text you should decrease the line height so it looks less awkward. the swirl brushes on the left side are also too messy, try a more succinct approach, like you did with the other swirls. This is another good collage wall! It's so rare for them to be good! I like the "scrapbook" feel of this one, it goes well with the characters. I'm not a huge fan of the pixellated texture, and the main picture is a tad blurry, but over all, good work! oh yeah, brillinat job! it looks very very refreshing! Awesome collage! really love the swirls. You're so good at making these walls, seriously. Cheers~! 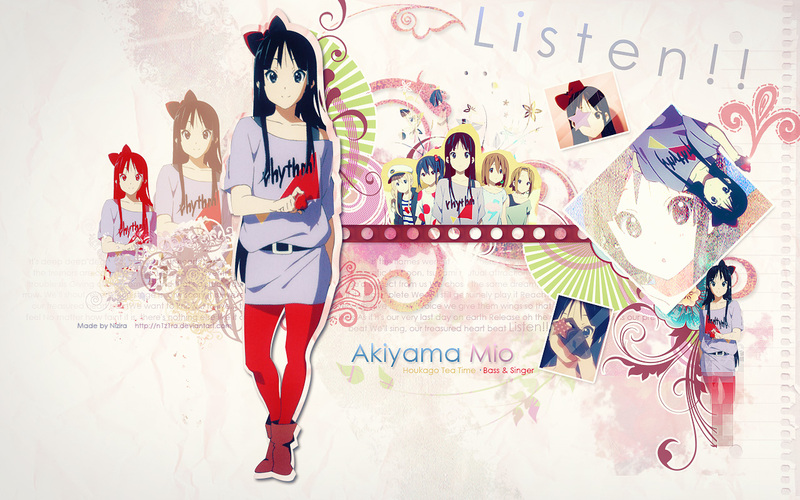 Great wall ... XD ... Mio Akiyama is the best! Good job! Very creative - not dull, or any of the kind. Mio K-on, nice wall ! Thanks !